To my disappointment, these past few weeks I haven’t been able to bring myself to write very much. Friends had suggested writing through my grief, diarising it, as a way of working through the process. But what I’m finding is that my thoughts and feelings are changing so quickly that I distrust whatever I write down when I come to reread it, and I fear that whatever I write won’t do justice to Lecretia’s memory, or that it is too self-centred or earnest. No matter how aggrieved or full of self-pity I might feel, the magnitude of my wife’s loss is infinite in comparison with mine. The morning Lecretia passed, and I had to front up to the cameras that day for a press conference we had planned a few days prior, I was in shock. I’m not sure what carried me through. And that was followed by a week of planning, and decisions, and logistics, as we arranged for Lecretia’s funeral and her interment. I barely had time to process anything. I felt numb. Since then I have been at home, catching up with friends occasionally, but otherwise keeping my own company. I am intending to go through Lecretia’s belongings, but I keep putting it off. Her beautiful face is still everywhere, anyway. She’s inescapable, and I do not want to escape her. Her mother and father visited me and took away some of her clothes and jewelry, which is a relief of sorts. I did wonder whether being here alone would make me want to move. Yet it still feels like home, and I still feel connected to her here. Interestingly I found his loss of faith, which felt honest and raw, more convincing than its reclamation, which felt like calculus. It’s only now that I am beginning to really come to terms with what losing Lecretia means, and how much she was so foundational to who I’ve become over these past twelve years. With her gone, there is this massive absence, and things that I was so sure of, and that I took for granted, are no longer there. I keep reaching out to latch on to assumptions about life I thought I could be sure of, and find that what I thought was firm and solid ground has given way to an abyss. All those things that Lecretia meant to me, I am still attached to. They abide in me like hunger and thirst. And when I try and draw sustenance from the same places, out of habit, there’s now nothing. I know that I will need to find things to fulfill those needs somehow – the physical, the mental, the social, the romantic – but I know it’s months or more likely years before that will happen. For now I’ll have to endure this hunger and emptiness and it will always be a feature of who I am. I’ve spoken to a few people who have lost partners and they say similar things. It takes time, and it gets easier, they say, but it never really goes away. There is this strange sense that I am not mourning often enough, or deeply enough. That the intensity of my grief should be a perfect reflection of the passion I had for my wife. That I have short-changed her memory somehow, ridiculously, by not being utterly inconsolable for weeks on end. But the loss is felt in moments – as sudden pangs or vertiginous stumbles – and then they pass. It’s sorrow but equally a profound sense of unfairness. The injustice, if there was one, was not the passing itself, which was inevitable, but the timing, which was too soon. I feel for Lecretia’s parents most of all, as although all lovers must inevitably part, children almost always survive their parents, and that didn’t happen this time. And what an extraordinary expression of their love Lecretia was. How great their sense of loss must be. I am not sure what comes next. I feel unsettled. I think I want to disappear for a while, perhaps visit some of the places that Lecretia had wanted to visit, but I don’t feel like I can until I get Lecretia’s affairs in order, which I have begun to do. I have known people to become reckless and irresponsible with their lives through grief. I don’t feel like that’s going to happen to me. I carry her with me now, and at the moment I feel like I have a duty to honour her memory by being my best self. But I am not out of this process yet, and I think I have some way to go. There is much to do. Beautiful, big hugs for now and the future days and months. You’re amazing Matt. I was a school friend of Lecretia’s (Intermediate and College), and have never met you – yet feel I have come to know a little of you through what you have written; and can only surmise that I have been reading about one of the most incredible love stories of all time. I hesitate to say such a personal thing, but I actually found myself weeping for your loss last night; and can not even imagine what it is like for you to be going through this. I believe you will eventually recover (though never get over) losing Lecretia, and that she will always be in all of our memories. I also strongly believe, that in time – the words you have written so eloquently will be published as a book. You are an incredible writer, and an amazing human being – and as I have mentioned previously; I am so glad that Lecretia had such an awesome life partner to share her world with. Bless you. Stay strong – or weak – whatever works at the time, and give yourself time to breathe. Much love from us – Lecretia’s former friends in Tauranga. No on can tell you how to grieve Matt. It’s different for us all. You’ll have days where you feel it most acutely and then other days you’ll get a lot of Lecretia’s affairs sorted and feel really accomplished. There are so many different emotions you go through at a time like this and they’re all linked to the grief you’re feeling – including happiness as you remember your lovely wife! Big hugs Matt, kia kaha god bless..
Matt I read every word of your posting with tremendous admiration for your strength and courage. Your lovely Lecretia is still very much with you and always will be, remember to permit her to remain a part of your inner soul. Nobody can fill the spaces, turn off the silence or fulfill the dreams but you – and eventually when the time is right, things will just fall into place. In the meantime give yourself time and space and accept the love and good wishes from everyone around you. Peace and solitude may well be your best friends for a while. In your own time, in your own way, there is no right or wrong way to do this, only your way. You’re doing such an incredible job and have done so for a very long time now. Thank you for selflessly keeping me informed of everything. I don’t know you but I have a big lump in my throat reading your words, Lecretia was a beautiful brave girl, taken much too soon, I don’t know what to say to you , we all stumble along through grief differently, but I know you have the public of NZ thinking of you, you both touch so many people hearts. For me, writing my feelings into poems was a great solace. Grief is a journey with many twists and pot holes. I think Keanu Reeves said it right “grief never ends, it just changes shape.” When our lovers die, we die, too. I found new life, a new me, but the changes were gradual. As for romance – not yet. My advice is, be kind to yourself. A truly moving piece of love and grief. Thank you for sharing. Thank you for sharing your grief so eloquently and touchingly. I too lost a spouse what before his time when we were young. Like you I was lost. All the things you describe are so familiar including the grief that feels like fear. There were times I was terrified and didn’t know how to stop the feeling. There were times I sat down and lost track of time only to realize later I had been sitting for hours or all day. Then there was in the early morning when I would awaken and thing he was still alive only to be hit by the terrible grief when my mind came fully awake and realized he was gone. Peace be with you any may yours days and nights become easier. I’m so sorry for the loss of your love. The road is long Matt but you do not walk it alone. Words can not express how sad I feel for you and yours and Lecretia’s family. No one should have to go through your loss but sadly so many people do. I hope you can take strength in the love and support from your family and friends and the caring words of hundreds that do not know you personally but are walking beside you in your journey.. You are an amazing man and your wife will be very proud of you. Do not force yourself to grieve in the way you feel you should be grieving, but naturally one day at a time. I read somewhere that grief is the price of love. It never goes away but becomes more manageable. It can hit you at any time through a smell, music a place. There is no order on the stages of grief, everyone grieves differently. Go easy on yourself. My heart aches for you and the pain you are feeling. I can understand and relate with you so very much. All I can suggest is write, write, write. It helped me so very much. Different circumstances completely. My loss was a stillborn beauitful baby at 36 weeks. I wrote for the simple reason was I was so afraid that I would forget something about her, what she looked like, felt, smelt….how I felt. So please write whenever you want to. All day long maybe sometimes, it doesn’t matter.nor does it matter what you write. It is for you alone, and for your loving wife. Don’t be afraid that you’re doing or not doing something right or wrong. Do what is right for you at this moment.if you feel like suddenly writing about how she smelt or a funny moment you had with her, or a time you had an argument…do it. I promise, it helps, maybe at the time of writing, or maybe another day, month or year. Nobody needs to read it, you don’t even need to if you don’t want to. But writing keeps life and your emotions, thoughts and feelings alive.Everybody grieves differently. There is no right or wrong.i think you are an amazing man to not only to have gone through what you have, but much of it has been so public. I will tell you one fact though. Because of Lecretia, AND you, you are changing the way people think, feel and behave. In essence, you have both made history….for the betterment of everyone. Now this is where we are the same in a way. When I lost my baby Holly, stillborns, losing a baby was very much a must not talk about subject…just like the subject of choice of death. So I don’t bore you with the details, but to,say, nobody knew how to deal with death of an baby. I had this massive need to do something about it…Just like Lecretia and you did. A force so strong and you become so passionate about it. So I do massive amounts of research etc, wrote a booklet and started a group called S.A.N.D.S which stands for stillbirth and neonatal death support. There are now support groups throughout NZ and Australia from this. My booklet, which was only small, but covered all aspects on what to do, feelings, funeral, and lots of stuff, went to every hospital, maternity home in NZ. I had many conferences with doctors, specialists, nurses throughout the country. it was all about education. That was now 29 years ago. now so much happens and good things at that for those that experience such a loss. I feel so honoured and proud that my loss has helped thousands of people.I know that the same is going to happen with Lecretia and yourself. Both our girls had a reason to be on earth, and you and I were the chosen ones to carry on their work, reason for change. So cry, laugh, and write. Everything that is happening to you,your feelings, your grief is meant to be. You are fantastic and Lectetia knew that.Sorry this message is so long, but I felt I had to write and let you know. And if you have read it, I thank you very much.cause I’m sure you get so much to read everyday. Hi Matt, thank you so much for putting your feelings into words and then on paper (of sorts) to share. Grief is a long journey and as you have come to experience from one minute to the next ones emotions change. Your time will come when you will reach into the pit of your stomach and cry the deepest tears of grief, I hear you when you say you don’t think you have done justice in grieving in a way that is worthy of her and that is ok, it is a process and no matter how much you are aware and know what each stage you will go through, it doesn’t make it happen any faster. You are doing well by taking time for you, sharing with others. It is good that you are aware not to withdrawal totally. There is no rush to remove Lecretia’s things, you will in your heart when the time is right, I wish there was an easier way to get through this. Those of us that are with you in grief are here for you. Well written and expressed, grief holds no surprises after this, Lecretia will be proud of you …. Matt, Your writing pretty much sums up what I went through in the first few weeks after Yoka passed away. I did the same, put all her things in order then wandered off to Europe for 6 weeks to see some places we’d never visited. While it was incredibly lonely at times, looking back now it was good to do – in that in started me thinking about my life – without her. My wife also fell victim to the GBH of GBM. I was lucky enough to have had a brief Facebook conversation with Lecretia and know she shared some of the angst and the fears of what was happening. I know how you feel and can genuinely say that from experience. You probably feel guilt, anger, sadness, indescribable emptyness, sorrow, self pity and a whole host of other things. That’s ok. If anything it shows us how much we still love the one we lost and that we will never let them go. My best wishes to you over these next 12 months. They will be tough but you will recover. You will never let Lecretia go, but the pain will subside. Matt, Just take it slowly .. So many are thinking of you..
Beautiful honest words. Thank you for sharing your journey. I feel sure your beautiful wife though not with you physically will be close by you and I am sure you will feel her presence at different times. May the times of grief lessen and the happy memories surface more. Love from so many New Zealanders is offered to you and to the dear parents of such a brave determined and vivacious lady that touched the hearts of all of us. Mart I hope your life ahead will be gentler on you. I felt similar when my father died just over a year ago Matt. Not grieving enough, not honouring his memory enough etc. It’s hard not to belittle your own process through some kind of survivor’s guilt I guess. The grief certainly comes in intensely strong waves I found yes. Funny too, I bought mum a little book of writing on grieving, and by far the best piece in it was the first one by C. S. Lewis you have quoted here. Very insightful and moving. I always found you a very special person all those years ago Matt, I have been, and will be thinking of you a lot. Many tears shed reading this. So frank. So very honest. You are saying exactly what I have felt in my experience with grief. Thank you so much. Arohanui. My husband died at 54 (coronary). Your thoughts here very much remind me of what I thought and felt at the time. My total sympathy is with you. Things that helped – I kept a grief journal for two years. I carried out rituals meaningful to me, when my heart told me to. I read grief books – only ones that worked for me, like ‘A Grief Observed’. Thomas Attig ‘How We Grieve: Relearning the World’ describes the experience of the dangling connections to the lost person. I joined a support forum for young widows/widowers – I won’t put the URL here but you can find it. And of course, he tangata he tangata – people are the most healing thing. Hugs and healing for your loss. You’re description of how you are feeling is very familiar. I think we stay numb and don’t express the depth of our grief for quite a while. I lost my son and didn’t cry alot or feel many emotions often for the first year or two. I think it’s our brain keeping us safe from grief swallowing us. It allows you a little pain at a time until you can cope with feeling the emotions fully. It has been four years and I cry often now and really feel my feelings fully now. Be kind to yourself. You will walk your own path in grief and healing. If you ever feel like a good read on grief’s journey check Mitchell’s Journey out on Facebook. He writes eloquently and it is all so familiar and real. Thank you for writing. Really. I feel I would stumble with words at a time like you are going through, but you are very eloquent in your writing. I feel that through your words over time this will bring some type of peace and balance in your life. All the best on your journey. Beautiful and inspirational. Thank you. Thank you for sharing Matt. I really relate to what you have written. Everybody else goes back to their normal life and there you are trying to make sense of it all. The days drag on and seem meaningless. I thought I wouldn’t be able to live in the house we built together or even sleep in our bed. But how I thought I would feel before is not how I feel after. My grief was more intense watching the man I love fade away. Yet having him as a shadow of his former self was better than not having him at all. I know that I’ll be okay and one day I might be happy again. It seems like a long way off. Weeping is my way of healing from losing my young bro. It’s hard to weep because my parents didn’t allow the expression of grief. Reading your writing about Lecretia, let my head cry. Thanks. Honest and compassionate. My heart goes out to you. 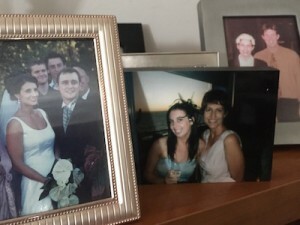 Each individual will process grief in their own unique way and at their own pace. There is no defined “right” or “wrong” way only that which each of us must do in the way which is best for us at any given moment as we struggle to come to terms with our loss and move on to the next step of our memory stairway. Stay strong and true to yourself Matt and let others deal with what they are thinking, feeling, experiencing. You can each support the other without compromising your own space. I, even after 9yrs, still have sudden moments of intense grief for the loss of my partner, though they are much easier to contend with and do not last as long. It is so important to take time for yourself as and when you feel it to be right. Best wishes on your journey I feel sure you will always have the wonderful memories to ease your path. Death is a hard thing for everyone.You have had to deal with it in the public eye which is never easy.Give yourself time to grieve in your own way.A discussion has been started making us all take a long hard look at things.This is a good thing. No one can lessen the pain you feel. Keep the good memories alive in you and stand strong you need to see what she started through to the end. Make every day count.One day at a time. So tough. Though a shared experience grief is so isolating and individual. Friends family will listen and understand even when you dont. Matt, you are such an inspiration to so many and so many of us are thinking of you and feeling your grief. We all wish we could help but this is your own journey, in your own way. Whatever you do, however you do it, there is no right or wrong way. Just know we do care. Not a day goes by when I don’t think about Lecretia and her amazing bravery and the love you had for each other. Someone said”Grief is the price we pay for love” and so true. The greater the love, the greater the grief. People all over the world will be thinking of you and Lecretia with enormous admiration. 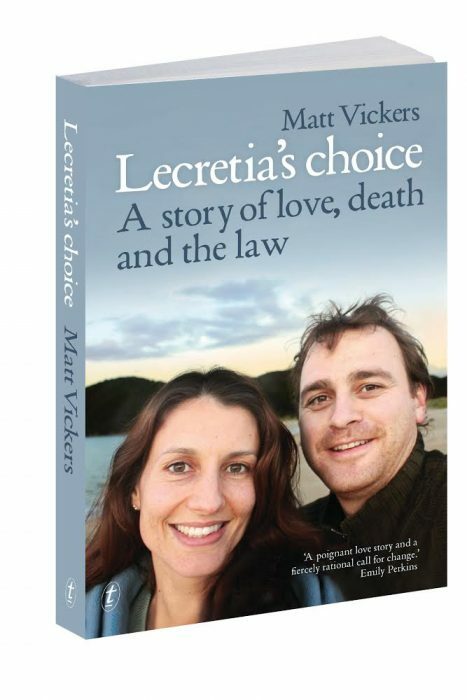 As New Zealanders we must continue to support the work Lecretia has begun. Beautifully written and totally understandable. All too often I speak with families who have relatives in a situation comparable with Lecretia’s but I cannot imagine what it must be like to be in that position. There is a poem called So Many Different Lengths of Time by Brian Patten. I read this at a friends funeral and it was read at my dad’s. It is well worth looking it up on Google. To me it really explains how people will be remembered. You have the best excuse in the world to be selfish at present Matt. If you feel like having time alone you should do so – don’t feel obliged to have visitors you haven’t invited. There is no right way to be or feel when you loose someone you loved/love deeply. Just flow with the process and try not to sit on the outside looking in and judging yourself. I think what you and Lecretia have done is monumental, it’s started a conversation that desperately had to begin. I can’t imagine how you must feel now but I suspect a need to find yourself sits right alongside the feeling that you have lost a vital bit of that self. Be kind to yourself.